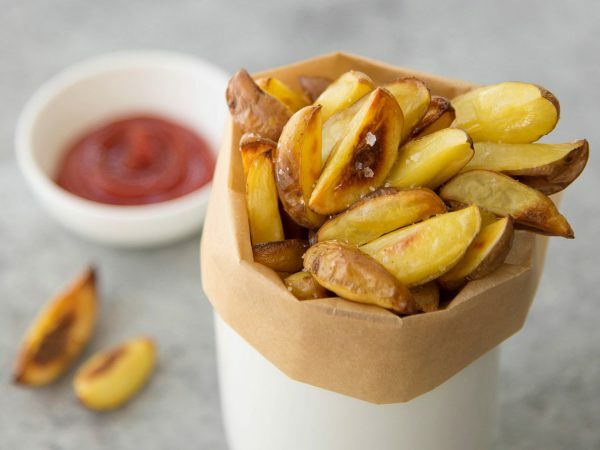 Crispy potato wedges! These wedges are perfectly crisp and a must for any cookout or veggie burger. Halve Little potatoes. Depending on size, you can quarter them into wedges. Combine potatoes and one tablespoon of salt in a medium saucepan; add water to cover by one inch. Bring to a boil, reduce heat, and simmer until potatoes are just tender, about 10 to 15 minutes. Drain and pat dry. When the potatoes are cooking, preheat oven to 425°F. Toss potatoes with olive oil and remaining salt. Place in a single layer on a parchment-lined baking sheet, and bake for 25 to 30 minutes until very golden and crispy. Remove from oven and drizzle with malt vinegar. Enjoy immediately!